An unassuming sort of flower, for what it may be able to do. This flower isn’t really all that much to look at. It’s kind of pretty but plain and the plant it grows on isn’t much of a looker either. Why it’s important is because of its potential medical possibilities. That, and you can eat it. 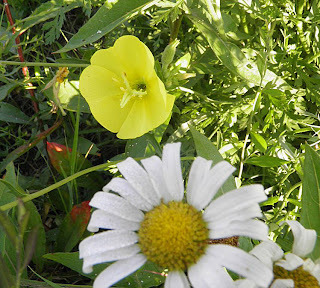 There are several different kinds of evening primrose. In Nova Scotia we have Oenothera biennis. Oenothera biennis is a biennial native to eastern and central North America, ranging from Newfoundland in the east, Alberta in the west, Florida in the southeast, and Texas in the southwest. It has also made itself a home in other temperate areas on the planet. Biennial plants have a lifespan of two years. The first year they form a “basal” (flat to the ground) rosette of leaves. The second year they bloom, disperse seed and die. Evening primroses like dry, sandy soil and can be found in open areas, often where soil has been recently disturbed. Clearly visible seed pods, as yet unripe. 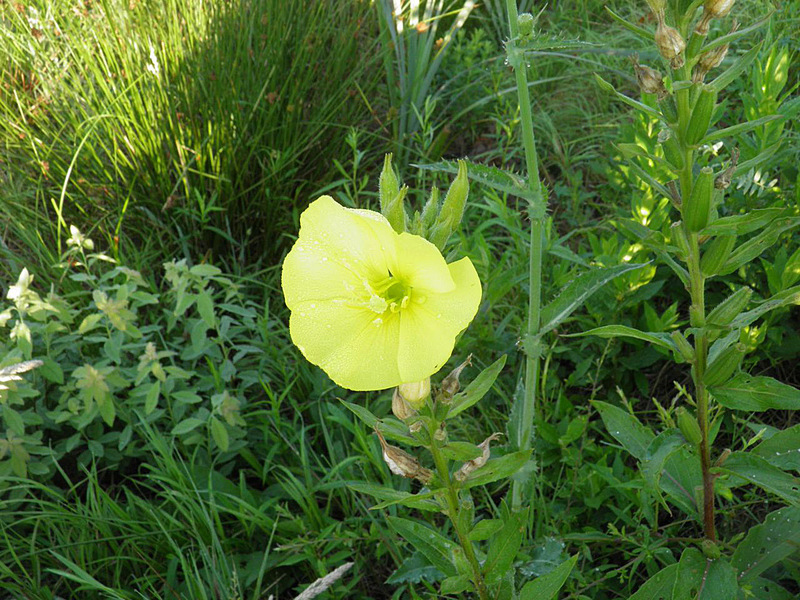 Evening primrose has bright yellow, four-petaled flowers. Each flower has a cross-shaped stigma in the center. They open by evening and are wilted by the next day. This is where they get their common name. Interestingly, under ultravoilet light a bright nectar “guiding" pattern can be seen. Moths, butterflies and bees can all see the ultraviolet spectrum. Their world must be interesting indeed. Evening primrose continue to bloom from the bottom of the flower stalk upwards over a long period during the summer. As the spent flowers fall off distinct pods form along the stalk. The seed pods are full of tiny seeds. The seeds contain approximately 7–10% gamma-linolenic acid, an essential fatty acid. 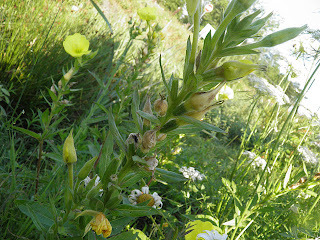 The seeds are the part that are used to make evening primrose oil. Evening primrose contains essential fatty acids (EFAs) called prostaglandins. There are claims that these substances aid in controlling high blood pressure, ulcers, asthma, allergies, migraine headaches, arthritis, glaucoma, menstrual cramps and possibly even some types of cancer. Prostaglandins were first identified by two separate studies, one in England and another in Sweden, in the 1930s. The hypothesis they were pursuing was that there are certain substances cells must have to function properly. EFAs are on that list. EFAss cannot be produced by the human body. We must ingest them from food sources. So knowing what sources of food supply these nutrients is important. And evening primrose oil is one of the most substantial sources of prostaglandins, one of the EFAs. The common daisy in the foreground gives an idea of scale. So that just about sums it up. It seems they looked a wide range of studies. By the way, all parts of evening primrose are edible. The leaves traditionally were used as a leaf vegetable. But they're a bit hairy and strong flavoured so you may want to taste a little first. The seeds can be used like poppy seeds and the root (first year only – not second) can be added to roasted vegetables or stews. It apparently is slightly peppery, kind of like salsify. The flowers, as is usual with all edible plants, can be tossed in to brighten salads. So feel free to gnaw on some evening primrose as you go on walks.